Costa Rica Has a Beach for Everyone! With two oceans and nearly 850 miles of shoreline, Costa Rica offers an astonishing range of beaches. There are white sand beaches and black sand beaches, sheltered lagoons and world-class surf, beaches with people and beaches with wildlife, upscale resorts and rustic cabins, beaches accessible by air or highway and beaches only accessible by sea or river. The only trick is in finding just the right beach for you. Surf? Try Playa Grande, Tamarindo, or Cahuita. Or test the "salsa" at Puerto Viejo. Gentle swimming? Samara or Manuel Antonio - or the calm waters of the Golfo Dulce.. Fishing? All Pacific beaches. Sportsfishing operates out of Quepos, Flamingo, Tamarindo, Guanamar, Punta Leona. Turtles? Playa Grande and Nosara. Or take an excursion north from Cahuita to Tortuguero National Park (in season only). Rain Forest? 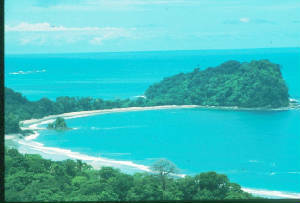 Punta Leona, Manuel Antonio, Dominical, Cahuita, Puerto Viejo, or head south to the Osa Peninsula. Wilderness? For wilderness adventure nothing surpasses the Osa Peninsula.